So much of what we observe in the scandals and failures of leaders today comes down to their choices in favor of success over significance. We have reached a tipping point regarding the foundational beliefs and the degree of acceptable unethical behavior we endure from our leaders. It is essential to instill a belief system which recognizes that in every act, no matter how small, leaders set a course for how ethical behavior will be nurtured within themselves and in their organization. That is an ultimate truth we can all believe in. ""There must be a paradigm shift for leadership based on significance."" With ""significance"" as a calling for a new breed of leaders, we can reverse this condition and advance a new, more ethical pattern of behavior for leaders in business and civic endeavors. It is time to rediscover honor, ethics and morals in the development of our leaders, and to make these qualities as central to their training as finance or business strategy. If society is to evolve in the direction of significance, we must usher in a paradigm shift: a redefinition of what it means to be successful. In Simply Significant, author Anne K. Chinoda recognizes this paradigm shift will not be easy, noting ""It isn't enough to penalize and arrest and condemn; that's like killing the patient with chemotherapy."" 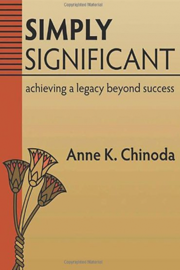 She gives readers a number of examples, stories, historical references and anecdotes that illustrate the meaning of ""significance"" while sharing several tools, exercises and tests to help readers examine their own ""significance."" Finally, at the center of the book is the primary foundation on which it is built: the Seven Keys to Unlocking your Significance.